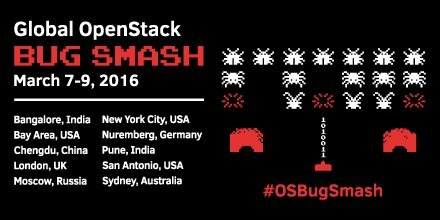 Today is the second day of the Global OpenStack Bug Smash for the upcoming Mitaka release. I attended to the local meeting here in Nuremberg at the SUSE office. The last two days I took a look at some cinder bugs that are related to Ceph RBD bug reports and pushed some fixes (e.g. for #1508340 and #1489134). If you are interested to help improve the next OpenStack release: take a look at the open bugs and check if you can help fixing them. You can find more information in etherpad or especially for the Nuremberg meeting here.